Ever since Karl Lagerfeld hosted his legendary Soirée Moratoire Noire party specifying “tragique exigée absolument noire” (“totally black tragic dress required”) in 1977, to say the goth aesthetic has captivated the high fashion world would be an understatement. In the latter part of the past decade alone, names such as Alexander McQueen, Thierry Mugler, Claude Montana, Jean-Paul Gaultier, Christian Lacroix, Ann Demeulemeester, Hedi Slimane, Gareth Pugh, John Galliano, Yohji Yamamoto and Olivier Theyskens have brought haute goth to runways from London to Los Angeles, and everywhere in between. It’s coveted, cutting-edge, and above all, captures the aesthetical gravitas of what fashion is all about; it is high fashion as it is meant to be. But such fashion isn’t just reserved exclusively for the runways of aging European capitals. It can also be the mode du jour for another world. Nestled deep in the woods of eastern Germany, Belgian-born artist Viona ielegems — best known for her surrealistic photography which blurs the line between paintings and photographs, letting the viewer’s imagination run wild — and husband Dirk Standaert helped transport attendees to a realm of magical decadence with the Danse Macabre ball, an event absolutely dripping with au courant revelry. Taking place at ielegems and Standaert’s own mansion (Heinrichshorst, a hunting lodge dating back to 1899 that’s played an important role in local history), guests from throughout Europe — and even as far away as Mexico — gathered to indulge in the company of one another in a shared passion for high romance. Standaert and ielegems have hosted such escapist paradise-style events in Belgium before (typically in Antwerp), but this was the first at their new home. It was, as they called it, “an inauguration” of the house. And what an inauguration it was. The theme of the evening: vampires. Not the denim-clad variety found in Twilight or the sinister sanguinarians of Dracula, but real-life creatures of the night — or at least those masquerading as such. Dark, mysterious, and alluring, it seemed the perfect theme for an event that was an edgy fairy tale come to life. Halloween kitsch it was not. The guest list read like a who’s who of the creative world: costume designers, photographers, writers, and all manner of other visionary types. World-renowned fangsmith Father Sebastiaan was on hand (he who is of the Endless Night Vampire Ball fame), as was forensic biologist/author/renaissance man Dr. Mark Benecke. Sebastiaan (real name Sebastiaan van Houten) set up shop in one of the upstairs drawing rooms, crafting razor-sharp incisors for those wishing to complete their vampire transformation. With unparalleled craft — a product of his more than 18 years of experience and training as a dental technician — the New York resident whose past clients have included Twilight actress Ashley Greene was one of the evening’s starring attractions. Jovially sharing stories and competing for the title of “most interesting man in the world,” the line for his services stretched down the hall and almost to the massive oaken grand staircase. As for Benecke — who has previously worked with the Chief Medical Examiner’s Office in NYC and gained fame for identifying the remains of Adolf Hitler — he proved somewhat more elusive. However, his insights into modern vampire culture, best explained in his book Vampires Among Us, opened more than a few eyes to a secret, hidden world rarely seen firsthand. But the star of the evening was unquestionably the venue. Rarely — especially in a country as rapidly modernized as Germany has become in the past few decades — is one able to truly feel as if they’d stepped back in time, leaving the politics and concerns of the modern world by the wayside. The Danse Macabre was that, bringing to mind the old salon shows that used to be the staples of Milan or Paris Fashion Week before over-commercialization encroached. The outfits were like bespoke Balenciaga, only more fashionable. Haute couture was a big-box thrift sale in comparison. Sequins, satin, chiffon, taffeta, silk and all manner of richly embroidered fabrics, were draped across the women in unworldly patterns. Corsets abounded, the skirts were almost as wide as some people were tall, and the accessories as outlandish as the hairstyles that alone represented several cans of hairspray just to hold them in place. John Galliano himself would have been green with envy. The only knock on the historical escapism was that it would have taken an entire kingdom’s gold to afford these wearable works of art. The darkly inclined world of the supernatural may have been the theme, but rather than a stereotypical profusion of blacks and other somber hues (though there was plenty of that), color was on vibrant display. Rich reds, brilliant whites, shining silver and others dazzled the eyes, flawlessly melding with glittery makeup that expertly straddled the line between stunning and the absurd. The exact era of the outfits was equally difficult to pinpoint. Was it Baroque, or perhaps Victorian? Is that headdress Elizabethan? Such questions abounded, but provided the perfect conversation starter. The food, sumptuous as the setting, was an elegant mixture of hors d’oeuvres and fine red wine (Dom Pérignon? It sure tasted like it), a perfect complement to the mood lighting that bathed everything in a warm red glow as stimulating as it was comforting. At once arresting, and slightly lingering, it was exactly the kind of fare one would expect in such surroundings. The riot of taxidermied animals and various bones carried a somewhat malevolent edge, but who said fairy tales were always safe? Subdued music with an ethereal melancholia wafting through the air allowed couples to swing to and fro across a Persian rug-draped ballroom with waiflike grace, but the real action was outside. A large balcony provided sweeping views of the well-manicured garden below, and the table conveniently located in the center soon became the hub for a buzz of fascinating conversation. Everyone had a story, from how they had arrived that evening — be it by walking in the woods for over an hour from the nearest train station, or carpooling across the Benelux countries — to just how long it had taken to create their outfits. The guest’s tales of their travels were particularly captivating, whether it was weekends in Venice or adventures in far eastern China. Hearing of such escapades stirred a passion to hop on the next plane to Zanzibar, sail across the South Pacific, or traverse the Silk Road on camelback. Amidst such parlor, it was a relatively easy to forget that almost everyone was wearing fangs. More wine was consumed. More stories were shared. Under the spell of the fashionable convergence, dusk turned to night and then to dawn. Emptying in a slow trickle, the last of the guests excused themselves just before dawn’s first rays cut through the foliage. More Cinderella than Dracula, care was taken to ensure no glass slippers were left behind. Gorgeous as the evening was, it was time to return to reality. For those privileged enough to have attended, the magic would remain long after — even though no one was bitten. ielegems’ next event is slated for March 30, 2013. 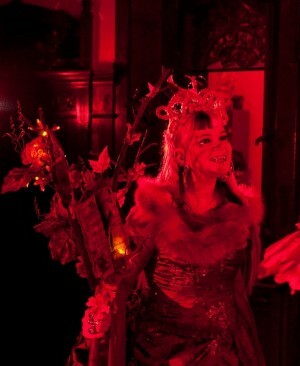 Taking place in Antwerp, Belgium, the “Gala Nocturna” is an annual tradition. Anyone is welcome to attend. While some details are still being worked out, one thing is guaranteed: the fashion will put even houses like Lanvin to shame. For more information concerning the past and upcoming events, visit www.viona-art.com.